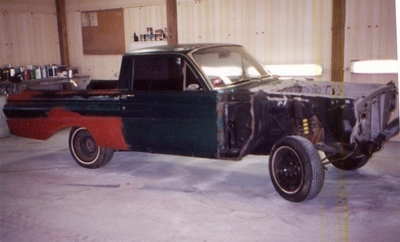 I first put the truck in the BodyShop 1/17/02. The rear quarter panels were cut off, and my new quarters were installed. The first Bodyman led me on for almost a year. He had quoted me a finished product price of $5,000. With all the work that needed done, I was very happy with the price. He told me $2,500 up front, and $2,500 upon completion. I gave him $3,000 up front, for a sign of good faith. Then, towards the end of the job, he managed to squeeze another $1,000 out of me saying he needed this and that. Not even a month later, I was told to pick up my truck. He hadn't finished it, and said he wasn't going to! (Needless to say how mad I was, I can't even begin to describe the anger and betrayal) So, I was in search of another Bodyman to pick up the pieces of my broken dreams. I found a man that came to my house to give me an estimate. He seemed to really know his work. He then began to rub and caress my truck. After what I had been through, I really had a weird feeling come over me. Almost like as if he were feeling up my wife right in front of me!!! Anywho, he quoted me $5,000 with a written estimate, and said payment upon completion. That's good he said that, because he wasn't getting JACK until I recieved a finished product! I have yet to recieve my truck back, though it should be soon. I have a link to past Bodyshop pictures, if your interested in seeing them. I have found this method of viewing this many photos to be quick and painless. Click on the link below to take you to my bodyshop pictures directory.